The Orientals also, like ourselves, use three coverings. The manner in which they vest the altar is thus described by Neale: “At the angles of the mensa are placed four small pieces of cloth, symbolizing the four Evangelists, and adorned with their respective emblems. Over these the catasarka of silk or stuff is spread, having four strings or tassels at its extremities, and over this the επενδύσις, ependusis, or exterior covering, generally worked with crosses” (i. p. 187). Although Neale agrees with Goar regarding the number of altar coverings used by the Orientals, still the latter mentions one—viz., the eileton—not named by the former (Euchol. Græc., p. 849). According to the Ritual of Russia, the altar’s first covering is a white linen cloth made in the form of a cross, the four ends of which hang down to the floor. It is called the stratchitza, and by it is meant the linen cloth left by our Lord in the sepulchre after his glorious resurrection (Romanoff, 85). The second covering resembles this in everything, only that its material is of a richer kind. This is denominated the inditia, and signifies the “glory of God.” The third article is called the iliton (same as the Greek eileton); it is intended to call to mind the napkin which bound the head of our Lord, and which the Apostles Peter and John saw “wrapped in a place by itself” (Greco-Russian Church, p. 85). The first cloth put on by the Copts is of a black color (mappa nigra). 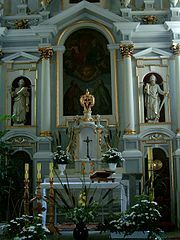 With them, and in fact with the majority of the Orientals, the altar is always bare and unfurnished except at Mass; nor must it ever be dressed unless when the priest is standing before it making his acts of preparation for the Liturgy (Renaudot, Liturg. Orient. Collectio, tom. i. 166). On Holy Thursday the Latin Church strips the altar of all its coverings and ornaments, leaving nothing but the candelabra and crucifix. This is intended to recall to mind the denudation of our Divine Lord during his bitter Passion (Bouvry, ii. 515).